India is in advanced talks with Sri Lanka to operate an airport on the southern tip of the island, where China has invested heavily as part of its Belt and Road initiative, a Sri Lankan minister said. Sri Lanka’s civil aviation minister, Nimal Siripala, said the country had been looking for alternative investors in the Hambantota area, where China has built a seaport and is in discussions to build an investment zone and a refinery. Beijing’s projects, backed by loans extended by the Chinese government and initiated by a previous Sri Lankan government, have faced widespread opposition in Sri Lanka. Local residents facing eviction to make way for the projects have staged numerous protests. Other critics say the Sri Lankan government signed up for unnecessary and loss-making projects, pushing the country into long-term indebtedness. There was no immediate response from the Indian foreign ministry to a request for comment on the airport deal. The initial investment would be $293 million, of which India will provide 70 percent on a 40-year lease, according to a Sri Lankan cabinet paper reviewed by Reuters that details the Indian plan to make the airport viable. The airport, built at a cost of $253 million by China, which also provided $230 million of funding, gets one flight a day, from Dubai, and has been dubbed the world’s emptiest airport for its long, empty corridors. The Indian government source said India had proposed establishing a flying school and a maintenance hub at Mattala to boost airport revenues while it builds up traffic. There are also hopes the airport could be a destination for Indian tourists. “We are trying for a large integration of the Sri Lankan and Indian eco-systems, we want to boost tourism in our two countries,” the source said. China said it was not aware that Sri Lanka was considering allowing India to manage the airport. China also put in a bid to operate the facility, but the two sides failed to agree on financial terms. India and Sri Lanka have centuries-old ethnic and cultural bonds, but these frayed amid New Delhi’s support for Sri Lanka’s Tamil minority during the island’s 26-year civil war, which ended in 2009. China was among the first countries that stepped in to help in the post-war reconstruction of Sri Lanka, building roads, power stations and ports. By 2014, Chinese navy submarines were also docking in Colombo, raising alarm in New Delhi and prompting a push by the administration of Prime Minister Narendra Modi to claw back influence in the region. The Indian source said New Delhi would allow Sri Lanka to determine the size of the Indian stake in the airport venture and whether it would involve state or private companies. However, some opposition groups are concerned that turning to India is equally fraught with risk. 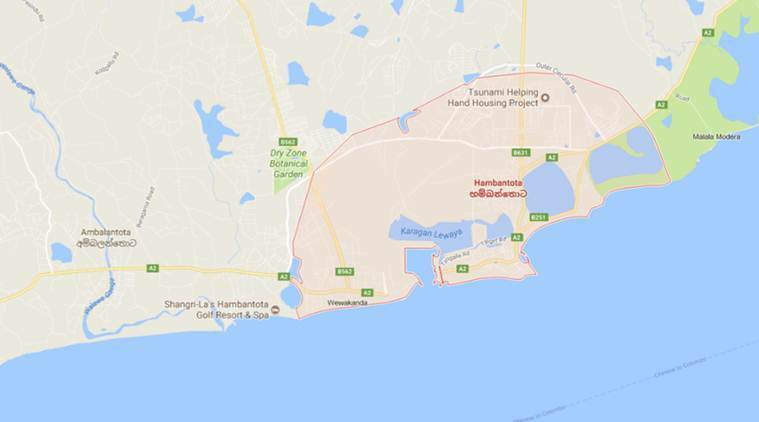 Dullas Alahapperuma, an opposition member of parliament, said the government was making a mistake by handing over national assets to China and India in Hambantota. “In the end, there could be dangerous consequences,” he said. On Tuesday, police detained three opposition MPs protesting in Hambantota against the airport lease plan. The three included Namal Rajapaksa, the son of Mahinda Rajapaksa, the former president who signed the construction deal with China. Siripala, the aviation minister, said any deal to give India the right to manage the airport was purely commercial and would not compromise Sri Lanka’s security interests.